If you've been asked to be a bridesman, congrats! Check out these tips to help understand your role and responsibilities. 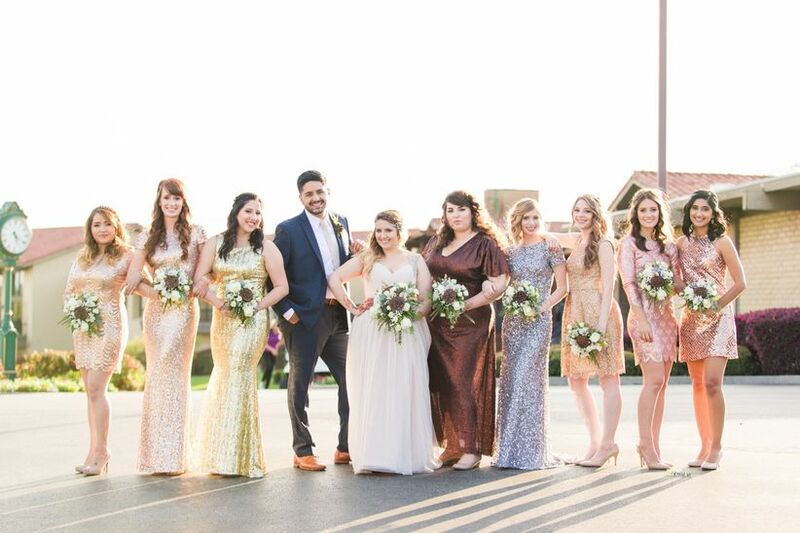 While the concept of having a “bridesman” (a male in the bridal party), is still a relatively new one, it’s one we’re entirely in favor of—couples should choose their wedding party based on who they are closest to, disregarding gender. If you’ve been asked to be a “bridesman,” you might be a little confused about what it entails and how different it may be from being a bridesmaid or groomsman—and we’re here to help. Whether you're a first-time bridesman or have served in the role before, here's a list of the responsibilities and duties you should be aware of. As a bridesman, you should be included in all pre-wedding bridal party communication. 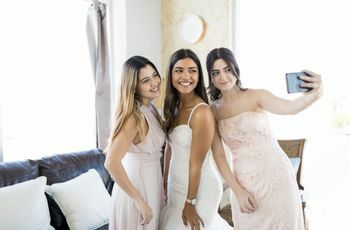 If the other bridesmaids have never been in a bridal party with a bridesman, they may be confused about how involved you want to be, and you might find yourself initially excluded from the conversation. Be upfront with them, and express that you want to be just as involved as they are (if that is indeed the case). Plan and attend pre-wedding events. As a member of the bridal party, you should help plan, and of course attend, the pre-wedding events, such as the bridal shower and bachelorette party. Some bridesmen might feel reluctant about being part of these traditionally female-focused events—we say, forget that. 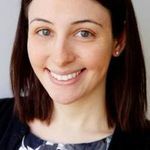 You were asked to be on the bride’s side, so you’re expected and encouraged to plan and attend the bride-focused events. You're not a groomsman, too. Repeat this mantra, "I am not a groomsman". You are on the bride’s side, and therefore you shouldn’t be expected to participate in the groom’s activities—unless you’re close with the groom as well, have been invited, and would actually like to join in. However, remember that pre-wedding events can be major time and financial commitments, so don’t overextend yourself. Wear coordinating (but not matchy) attire. Choosing attire for a bridesman can be a bit confusing. Should he wear the same thing as a groomsman or something completely different? We recommend a happy medium—similar attire to the groomsmen but with a twist. 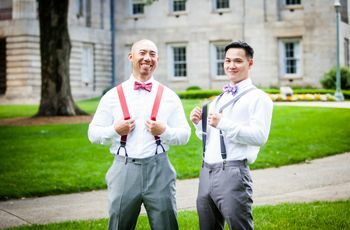 For example, if the groomsmen are wearing classic tuxedos, the bridesman can add a different boutonniere or pocket square to distinguish him from the other guys. Or, if the attire is less formal, perhaps a different-colored tie or an added accessory like fun socks will help make your look unique. Talk to the bride to see what she has in mind and don't be shy about offering suggestions—you want to feel comfortable and confident on the big day. Help in your own way. Be there for the bride in any way that you can by offering your help during the planning process (the list of duties is similar to a bridesmaid's). It could mean putting together favors, stuffing envelopes, or even just giving a guy’s opinion to an etiquette crisis. And on the day of the wedding, be there to assist the bride with any last-minute issues, including helping to keep things on scheduling, keeping track of gifts, and encouraging guests to get out on the dance floor. Get ready with the crew. On the morning of the wedding, bridesmen should get prepped with the bridal party. If the crew is wearing matching attire (like robes, pajamas, t-shirts, or tank tops), the bridesman should be included and of course, a bridesman should receive a gift as a thank-you for his help and friendship. Stand on the bride's side. It’s obvious that a bridesman should stand on the bride’s side during the ceremony. 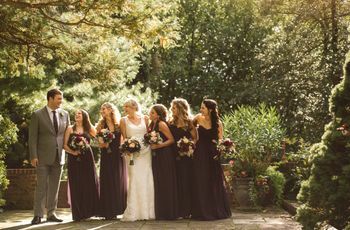 However, things could get a bit confusing during the recessional, when the bridesmaids traditionally pair up with the groomsmen to exit the ceremony. 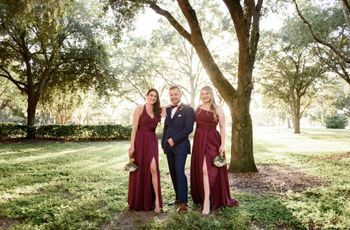 This all depends on how the numbers work out, but a bridesman can either exit solo, or walk out with a bridesmaid or groomsman, walking side-by-side instead of linking arms.